Thanksgiving. One of my favourite celebrations. October is the perfect month. The harvest is mostly finished, autumn has arrived, and it's good to gather with loved ones and acknowledge our many blessings. Although all of our dreams and hopes may be fulfilled, there is always, always something for which we can thank God. We celebrated with our children and grandchildren yesterday, Saturday, so that they could be with other family today. This afternoon Tim and I went for a ramble around Rithet's Bog. There is colour if one looks for it, and that I did, finding golden trees that glowed in the sunlight, red leaves that swung gently back and forth, and plenty of pale brown stalks of grass and fat, ready-to-explode cattails. Recent rains have begun filling the bog that was dry and bereft of ducks for the summer. The ducks have returned to splash and swim, not minding the debris and pollen in the air. A crow cawed from behind a curtain of yellow leaves shimmered and caught the light. He was a shy bird, not a show-off at all. Our three little grand darlings. The girl cousins play together so well, and Mister F. follows them around saying, "me, too," "me, too." How I love them. After our walk, I took my basket to the garden and discovered a few ripe figs, one zucchini, bunches of grapes and cherry tomatoes, and lots of lettuce. The kale and carrots I left for another day. Tomorrow is the actual holiday, but we've always had the tradition of having our dinner on Saturday or Sunday to leave Monday as the day for doing little or nothing. Wishing all my fellow Canadians a very Happy Thanksgiving. PS. I added a bit of information to my previous post about the memorial stone for Lucy Partington at Hailes Chapel, with thanks to Rosemary of Where Five Valleys Meet. Happy Thanksgiving. Looks like it was a gorgeous weekend. My fondest childhood memories are holidays with the family and playing with all my cousins since most of us were close in age. Have a restful Monday. We had the family around for Thanksgiving dinner tonight...it was lovely. A lot of preparation on my part, and everyone seemed to enjoy the food...it was loud as there are 3 grandchildren and 8 adults all chatting at the same time! Rithet's Bog looks lovely through your eyes Lorrie! Happy Thanksgiving to you and your beautiful family, Lorrie, your grands are gorgeous I can't believe how they've grown. So beautiful grandchildren - we have really a lot to be thankful for. Happy celebrations! 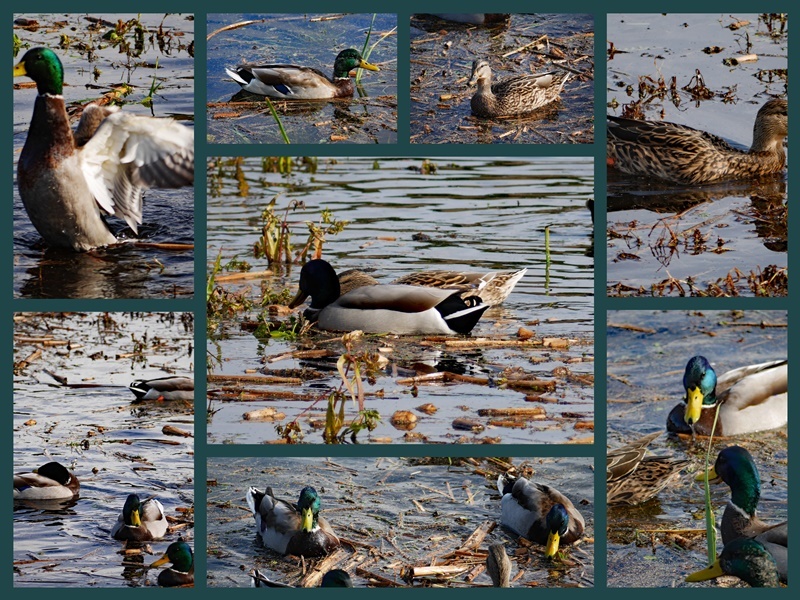 The duck collage is so pretty. Happy Canadian Thanksgiving! 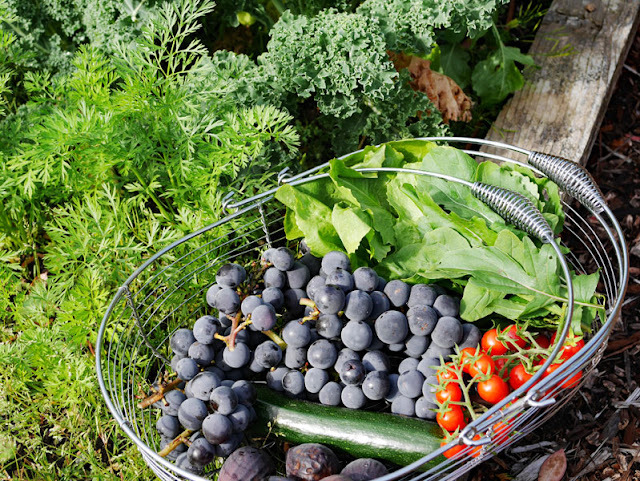 You still have quite a little harvest in your garden. We have one more Courgette nearly ready, and then the plant will have to go. What a lovely post, Lorrie! One can't help but admire the colour around us this time of year. 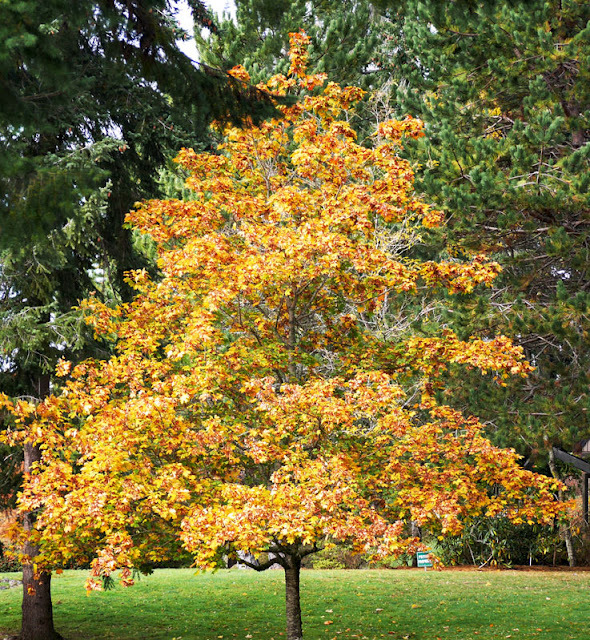 Our trees are changing very quickly now that the frost is paying us a visit overnight. Happy Thanksgiving to you and your loved ones and thank you for sharing. You are certainly blessed with three beautiful Grandchildren, sounds like such fun to have them all together. Happy Thanksgiving. Happy Thanksgiving, Lorrie. Your walk appears to have been very scenic. The duck collage is wonderful. Grandchildren certainly are a blessing. The collage featuring your grands is adorable. I know you must have enjoyed being together yesterday. Your garden harvest is most impressive. My summer garden was a total dud. Hoping for better luck with the cool weather greens. Happy Thanksgiving, Lorrie! We also celebrate Thanksgiving on Saturday or Sunday so that we can just take it easy on Monday. Enjoy the last day of the long weekend! Happy Thanksgiving! It is a beautiful time of year. I enjoyed seeing your visit to Rithet's Bog. You grandlitles are too cute! Adorable! Happy Monday! Enjoy your week. Happy Thanksgiving to you and yours Lorrie and Happy Mosaic Monday. Lovely photos and mosaics! 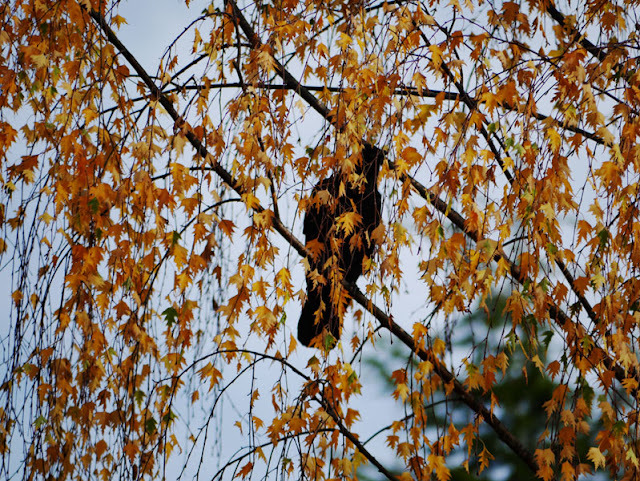 Wonderful, as always, your shots, darling Lorrie, thank you so much for sharing your so lovely Autumn with us ! Fabulous photos, so happy to have found your blog, I have lots of distant relations on Vancouver Island so was particularly happy to find this! Happy Thanksgiving, to you and your family, Lorrie! You grands are so cute, and your photos of them capture their sweetness! Beautiful photos of your adorable grands, gorgeous surroundings and fresh and fabulous fall harvest. Gathering with loved ones makes any event extra special. 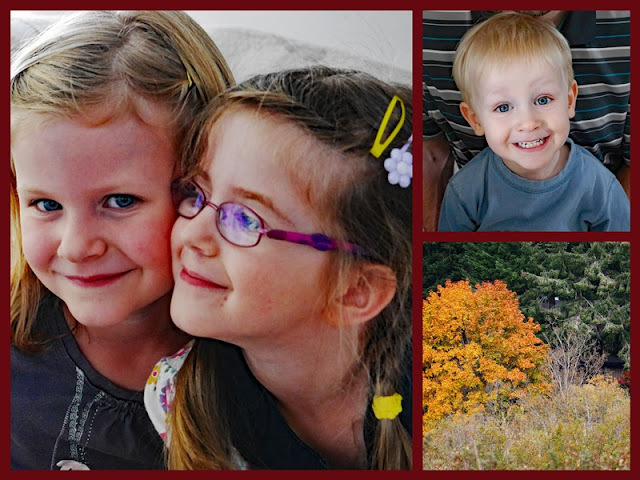 Beautiful autumn pictures, Lorrie, and such sweet ones of your grandchildren. Wishing you a very happy Thanksgiving and a wonderful autumn. A belated Happy Thanksgiving! It sounds like it was a good weekend. I am already looking forward to Thanksgiving next month. For some reason I have been so hungry for the traditional foods. Loved your autumn photos and your grandchildren are just precious! Lorrie, I hope you enjoyed your day yesterday. Thanks for sharing your Thanksgiving with us. Sylvia D.
There is always something to be thankful for, I agree! Happy Thanksgiving. I just found your blog and I love it. I'll be back. Happy Thanksgiving, your weekend looked wonderful. What a delightful weekend! Happy Thanksgiving...a little late, but the Giver keeps on giving and it's never too late to be grateful! Love the photos of your "grand darlings"! It sounds (and looks) like you had a lovely Thanksgiving weekend! Your grandchildren are adorable...and growing up so quickly. So so much to be thankful for and I'm happy our countries have a day set aside to acknowledge that! Cute grand kids!! what a lovely long weekend ... combo of family time and quiet time and good food is perfect! October makes more sense for a harvest celebration than our November really! Your grands are adorable. 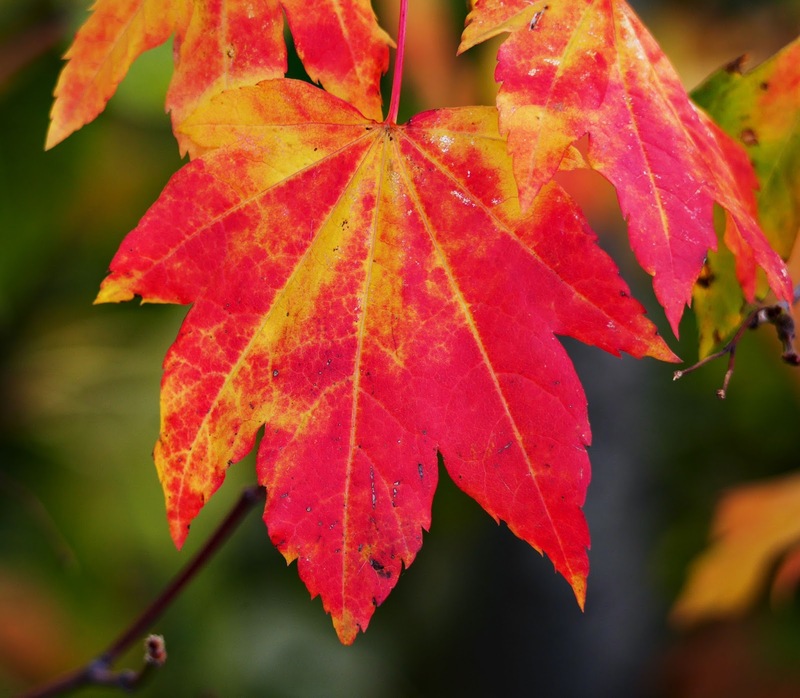 Loved the Autumn photos. It's a beautiful time of the year. Happy Thanksgiving!